I have always liked Hitesha's writing , from the days I started as a follower and lover of her poetry oN twitter. That she would one day surprise with a Fantasy fiction book , was beyond my dreams. Such an engaging tale she has spun in this book. 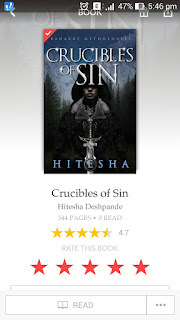 I am a little biased when it comes to fantasy fiction books , and having read multiple of those over the years , I have not read any book by an Indian author this fast like I read Crucibles of Sin. There is a goddess who has created this warrior sect , there is a queen who chooses her partner based on his skills in swordfight , there is a cursed lover who talks and commands the creatures in forest and then there is the whole politically motivated set of kings and ministers vying to get hold of the power that Rankrt themselves have no clue of. This was a heady cocktail of good , evil , power , duty and revenge. As much as the Ranakrt guys have a dark character , the development and the backstory of these people was handled very carefully as not to become a repetition and to keep readers in their favor and actually feel for them. The title - Crucibles of sin was well justified not just in the end ( mostly there ) but all along the story as you realize that the Ranakrt are all because of the sins they have faced and been through. Each and every character introduced has a role to play in this tale and it keeps your attention to the pages. the action sequences , the conversations and the locations all come alive while you read. A lot of wheels have been set in motion in this part and I am eagerly awaiting for the next part to take the story forward , to a conclusion like each epic is supposed to have. Fantasy fiction lovers will surely enjoy this one. The book can be accessed only via the Juggernaut Books app. Download Juggernaut App here - http://onelink.to/jgnt and download this book. You can even buy the book in parts.